Keylite Loft Ladders are the ideal solution for easy and more importantly safe access to your loft plus they are easy to fit! 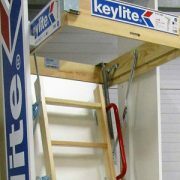 We are now stocking Keylite Loft Ladders and Roof Windows. Pop by our shop to find out the benefits of using Keylite products!